This was mentioned in the New York Times Science Times section, under Observatory by Henry Fountain. Excellent! I'm thinking most animals are more intellegent than we know. that includes groundhogs, rats, squirrels, goats, and porcupines. nice picture, by the way. I totally agree. I used to like monkeys but not anymore. Pardon my comment. I strongly detest them now. I like the article too. well,this WILL be disturbing. what are other monkeys planning, you ask? here's a story: ths lady had her pet chimp, which was running away so she called her friend over to help.well, the mokey got mad a tore her face off-almost literally. she lost an eye, lots of blood, a hand, and had to get a face transplant . the people said she looked like she got her hand stuck in a machine. she is alive but they beleive she has mental damage. that is TRUE. it was on the news. its so sad. even if you never pray, you should. "The thing with Twilight is the stupid movie, emphesis on 'stupid'. It's going all popular because of that dude that plays edward in the movie. Let's all take a minute of silence, thinking of nasty names to call him." You said that in one of the previous posts. That's so funny! (Well I don't want to call him nasty names or anything) but, people just think he's so good because of the role he plays! Edward Cullen! To me, he looks and sounds like Johnny Depp in Charlie And The Chocolate Factory, and when he walked away from Bella, he looked like The Hulk. Seriously! I just watched the movie a few days ago, and I collapsed on the floor laughing my head off. Also, a thirty one year old chimp, so cute! New York Times seems to have such interesting things inside! If you ask me, the movie is sick. Completely different nature of vampires. Now, everyone is more afraid of candy then they are of vampires! What is wrong with people these days? They are rabid freaks of nature, killing to survive. I say, die already. At dinner last night, after i read this, my parents mentioned it! freaky. Oh, and i SO agree with anonymous and Irregular Kiki on the subject of Twilight. especially #3. i mean, he said himself he wants to eat you! Just wondering. How did the topic get from mastermind monkeys to badmouthing twilight ? "Cassidy, I'm coming in" said a voice I only knew too wel. The door opened and there stood, the one, the only... Mr. Mellows, bearing a wiked grin on his face.
" Cassidy, Cassidy, Cassidy, you always where a handful. If you haven't been writing notes in my class probably none of this would have happened." WOW, that is the coolest thing on your blog in a while! And that is saying something! I looove that chimp. So comical! TWILIGHT HATERS: Twilight is awesome. I didn't love the movie, and it seems that that is what you are getting mad about. Read the books before you hate. Though I agree, Bella is kinda dumb. She's really not an original character though. Ugh, how is it that, no matter where I go online, Twilight always comes up?!?!?!?! I'm so sick of hearing about it!!! Former fans are even starting to say it wasn't that good! If you want to talk about it, find a Twilight discussion board or something!!! Wait... What are we talking about? ?A? 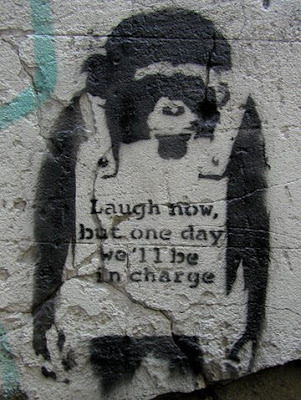 Monkeys to Bansky to Twilight to monkeys to Banskey to monkeys? *reads preceding comments* Oh, golly. Disregard that little bit of insanity, please. yeh i like twilight booksz but not the movie. Ha! this whole comment page is about twilight now! You guys are all going to kill for this BUT......I'm siding with the Ape. I would do the same thing if I was held hostage in an artificial"natural" habitat. I think we should kidnap him and take him to Spain, where they have animal rights! yes, I agree! (I think) Monkeys recieve restraining order! Now, cough up the bananas and no one gets hurt! hey anonymous, i totally agree with you. all my friends are gooey for twilight and i just plain hate it. i read all the books, watched the movie and i still hate it. i mean come on, bella is soooo dramatic, dumb,and she just doesn't get the fact that edward is a vampire and he wants to EAT HER!!!!! a really good vampire movie is 30 DAYS OF NIGHT. it takes place in alaska, but be warned it is a scary movie, but it shows how evil, vile and cruel vampires are!!!!! okay look, im not on any side okay just so yu know.-but puleez! just quit it with the anti twilight. i find it to be a pretty okay book. (not as gewd as kristen's or maximum ride but still) can we go bak to the evil mastermind primates?